There are many approaches to producing art. For sometime now, my works emerge from dark to light. I start working from a light background and then to a dark background and finally bringing light into the piece. I keep revealing the initial marks made on the board by knocking back the washes and adding lighter tones of paint. I realise many artists work in this way too, finding the light in their works emerging from the dark. It is a fascinating process, especially when one can use the white of the blank canvas or paper. With this you are invited to disturb the stillness of the white surface. It can be daunting to commit to scar the sea of white; to make the first step before the dark comes. You are building an image on white whereas, when you are working in reverse, you are working hard to reveal the image. Uncovering the imagined image held in your head or hand is like working in the dark. An idea can often appear to arrive from nowhere. Likewise, with the conception of an artwork, it can seem to have come out of the dark, from the depths of our minds. Sometimes great works of art are created out of difficult circumstances or state of mind. All new projects for artists bring uncertainty and anxiety until progress can be seen. What is wonderful is that they have the ability to work through these emotions and produce the results before their eyes. It is a cycle, battling to start, working through the dark and finally the completion of the project. And then the wheel moves around again. Everything has a beginning middle and an end. This exhibition explores the ideas behind the those pieces that emerge from dark to light. Works can be seen by Canadian ceramicist Lesley Mcinally. Most of Lesley’s beautiful vessels’ surfaces move from dark to light. Her use of texture and colour is like painting on pots with the subject matter that most inspires her; landscape, weather and archaeology. Significantly with ceramics, the maker/artist never really knows what the end result will be until the final firing. She can have an idea from years of experience, however unlike painting or sculpture, the feedback isn’t instant, there is the time in between each process and each decision. Many artists/makers using clay as their art form are working in the dark. Italian Davide Galbiati’s sculptures are created from blocks of wood or amorphous concrete. His pieces find the light by the transformation of the material to the artwork. The figures and forms have to surface from the depths of Davide’s mind to be born. This experience is typical for most artists working in the dark. 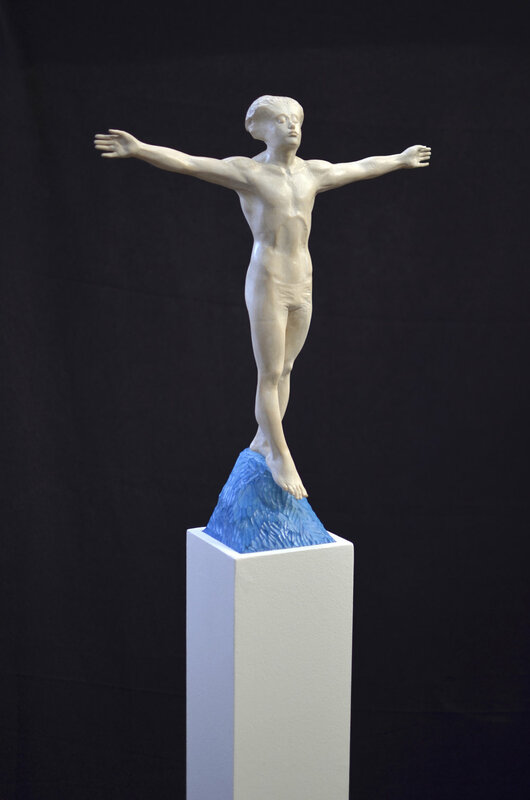 His often-angelic figures appear to be reaching and moving towards the light. Julie Allan creates mixed media works on canvas, using oils, pencil, plaster and stitching, producing sumptuous and moody paintings that emerge from dark to light and back again. She has been working on a collection that reveals dark and light atmospheres. The themes within her works are about mortality, sexuality and vulnerability of the human body.